Digital Rights Management (DRM) and adaptive streaming are key factors for premium Internet-delivered video. 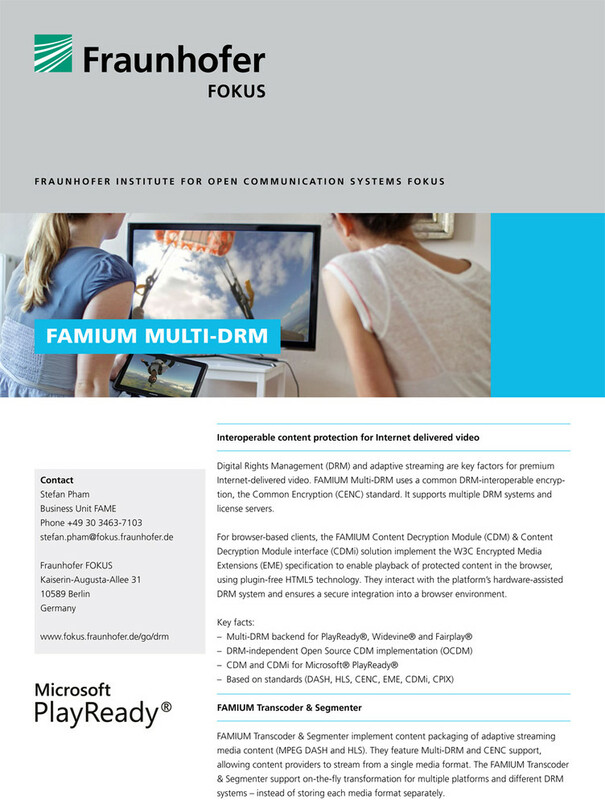 FAMIUM Multi-DRM uses a common DRM-interoperable encryption, the Common Encryption (CENC) standard. It supports multiple DRM systems and license servers. 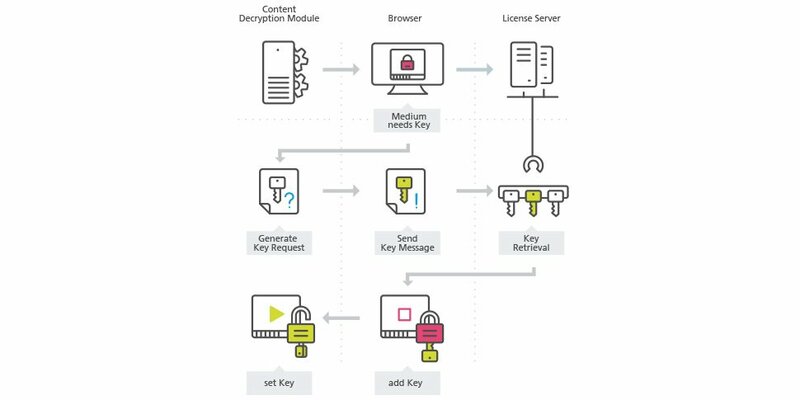 For browser-based clients, the FAMIUM Content Decryption Module (CDM) & Content Decryption Module interface (CDMi) solution implement the W3C Encrypted Media Extensions (EME) specification to enable playback of protected content in the browser, using plugin-free HTML5 technology. They interact with the platform's hardware-assisted DRM system and ensures a secure integration into a browser environment. To stay updated on the latest developments of FAMIUM DRM and news of Fraunhofer FOKUS FAME, please subscribe to our newsletter. FAMIUM Transcoder & Segmenter implement content packaging of adaptive streaming media content (MPEG DASH and HLS). They feature Multi-DRM and CENC support,allowing content providers to stream from a single media format. The FAMIUM Transcoder & Segmenter support on-the-fly transformation for multiple platforms and different DRM systems – instead of storing each media format separately. Playout platforms and devices support different DRM solutions, so today’s media streaming ecosystem needs a Multi-DRM backend. Leveraging CENC, FAMIUM encrypts content once and adds DRM-specific data to the media stream. The FAMIUM Multi-DRM solution supports DASH-IF CPIX (Content Protection Information Exchange Format) for interoperable and secure key exchange between DRM license servers. A CDM is required for DRM in HTML5-based browser environments using EME. 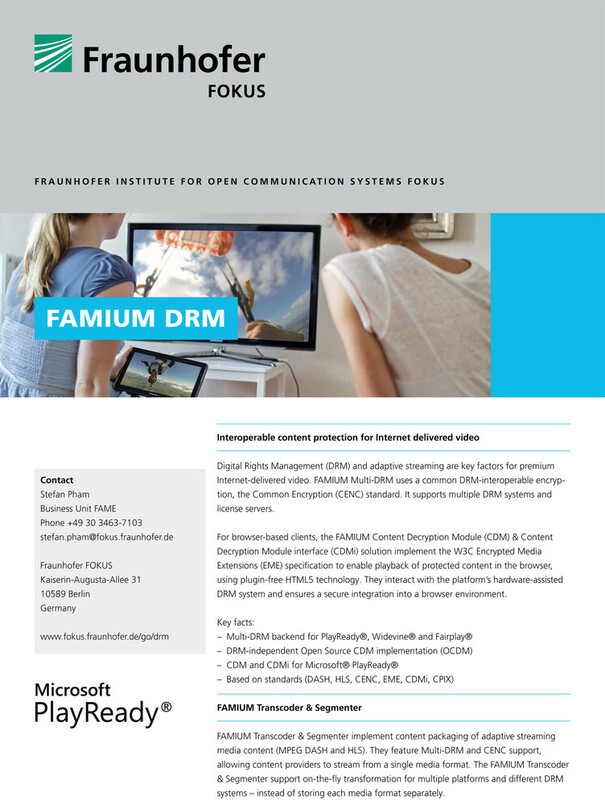 Fraunhofer FOKUS maintains the 'Open Content Decryption Module' (OCDM), an open source project on GitHub. The implementation enables DRM interoperability and has been integrated with Chromium, Opera and Microsoft PlayReady. 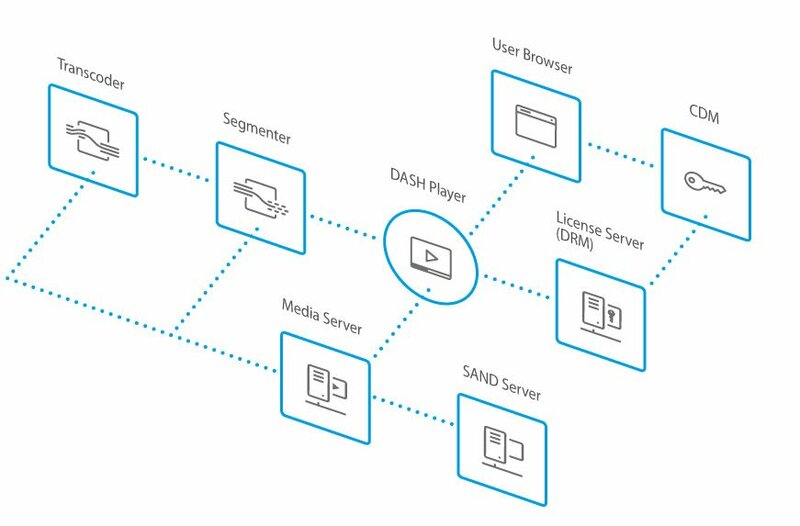 In combination with the FAMIUM DASH solution, CENC allows content providers to maintain a single media format, while supporting multiple platforms and different DRM systems – instead of storing each media format separately. Using the EME-based CDMi approach, the increasing number of HTML5-based platforms will support playback of protected content, without the need for browser extensions or plugins. We offer an end-to-end DRM solution and custom integration of specific components. Experience in regular interoperability tests ensure that our components are compatible across devices. For detailed DASH features, please see FAMIUM DASH.